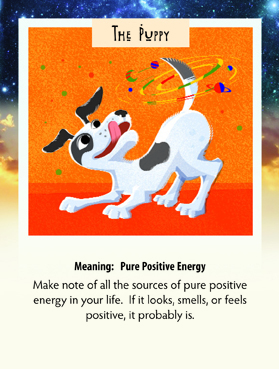 This week we have drawn the Puppy Card which has very special meaning at this time. One year ago on March 10th, the man who created this card left us. He was Japanese. So ironically on the anniversary of his leaving, Japan had the worst crisis since before his birth. Not that there is really a connection except for those of us who knew him and especially his parents. I was so affected by what continues to go on in Japan that I didn’t draw a card yesterday. Then last evening I got a phone call from his parents in Japan letting me know that they were OK. I know his mother had planned to travel here for the anniversary of his leaving, but I don’t think that is easy now. So this morning I drew Ryoichi’s puppy card! You just can’t make this stuff up! Really, we need to remember that all is really well with our spiritual selves despite what the world looks like around us. We are ALL eternal and, in our pure positive state, as happy and as innocent as that puppy! So is Ryoichi reminding us on this date that really all is well? You can see the joy on TV when people find each other alive…and certainly the grief at all that were lost. It is a time for us to look around and truly appreciate those we have in our lives that bring us joy and positive energy. We would be wise and feel better to take a moment and appreciate all the good that we have in our lives. So did I get it right Ryoichi?